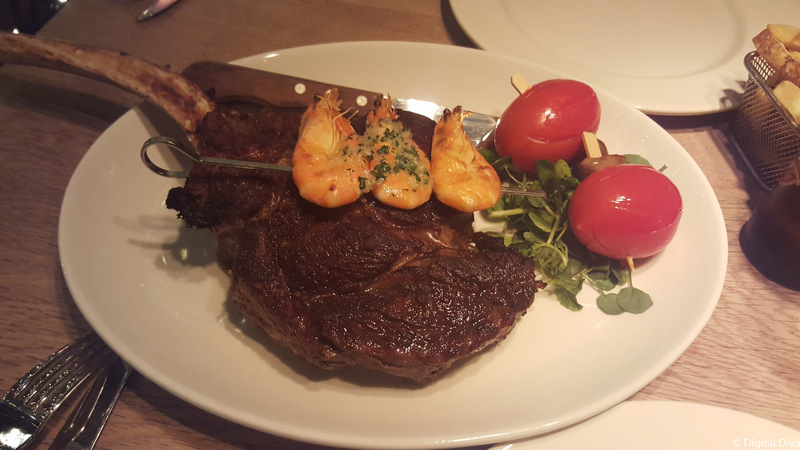 We were invited along to Blackhouse Restaurant in Leeds to try their menu out. I hadn’t been to Blackhouse “Grill on the Square” before, so was really looking forward to seeing what the had to offer. J is a big fan of steak too…so it was a no brainer really! Blackhouse restaurant is where Est Est Est used to be in Leeds (if you’re 30+ and from Leeds, you’ll know what I mean), just around the corner from City Square on East Parade. From outside you’ll spot the outside terrace (good for a cheeky cocktail after work) and the fairy lights that cover the front of the restaurant. The lighting throughout is very well thought out actually (we always notice good lighting) and the whole atmosphere is really good. Blackhouse restaurant has a lively buzzy vibe to it…a lot like a New York restaurant. There was a pianist/singer live, which normally I wouldn’t be a fan of…but this guy sang tunes from Basement Jaxx and others in a blues/swing style. It worked really well. 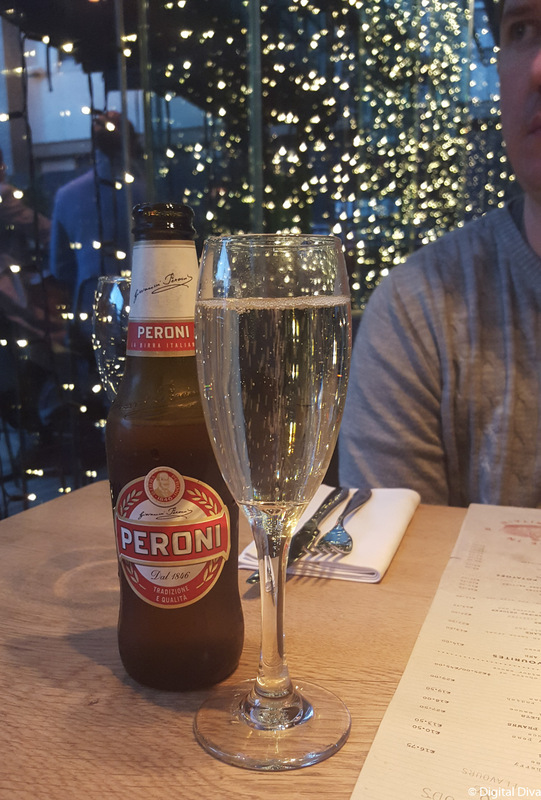 For drinks, J fancied the Orchard Pig cider, but they had run out so he had Peroni. 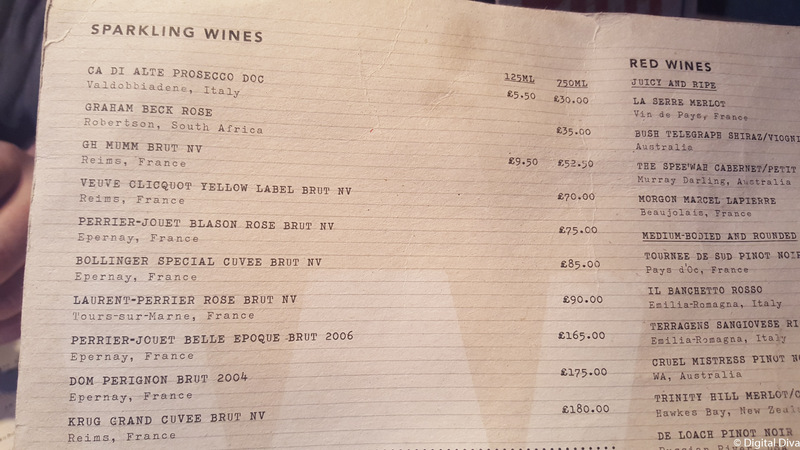 I had a glass of the Ca Di Alte Prosecco, which was lovely. 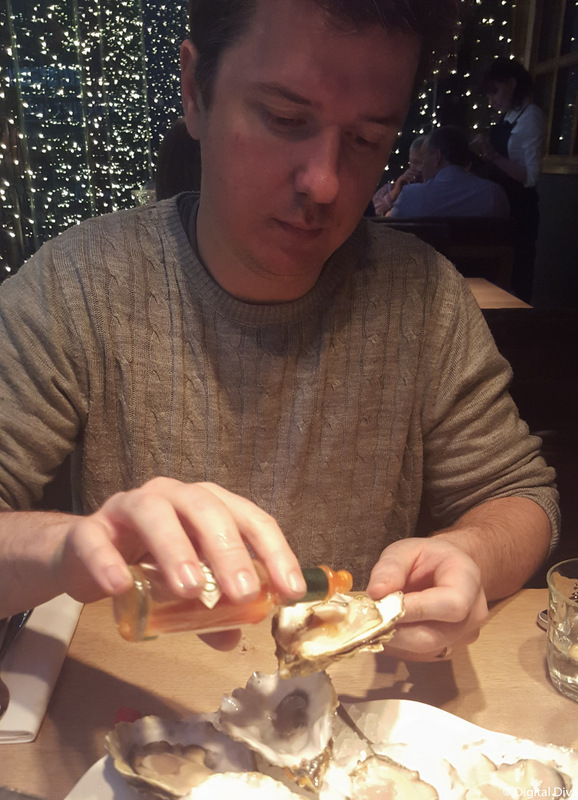 For a starter, we thought we’d go big…we went for twelve raw oysters with Tabasco sauce, lemon and chopped shallots in sherry vinegar. They were bigger than we had expected! Well, than J had expected…! We first found our love of oysters in New York. There’s a great place called The John Dory Oyster Bar next to the ACE Hotel which we just loved. Go if you’re ever in the city. The Blackhouse restaurant reminded me a lot of this place. 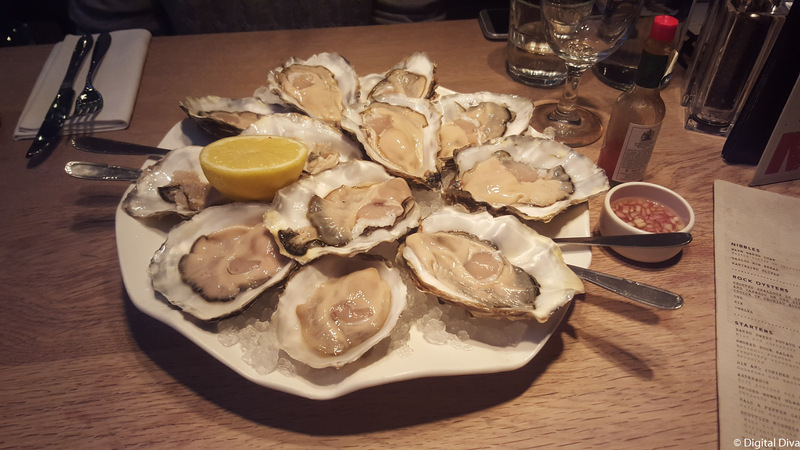 I think if we’d realised the size of the oysters at Blackhouse, we’d have maybe ordered six. They were very tasty though! …and some Tabasco sauce and shallots and we’re good to go! 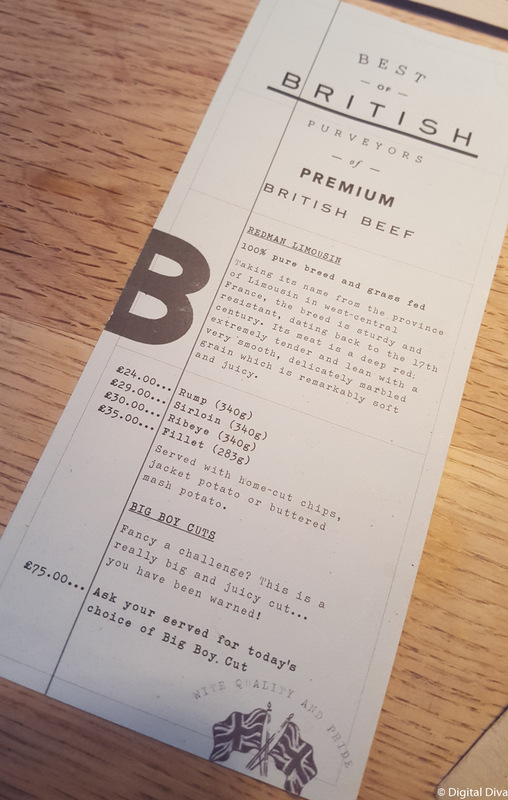 For a mains we opted for the Redman Limousin premium British steak. It’s 100% pure breed and grass fed. We obvs went for the big boy cut which is 1kg to share. We figured we’d be ok as we’d been sharing 1.6kg Rib Eyes in Italy recently. The waitress recommended either the Porterhouse (leaner) or Tomahawk (two rib eyes). We chose the Porterhouse and J asked for a skewer of garlic king prawns on top (an extra £5). 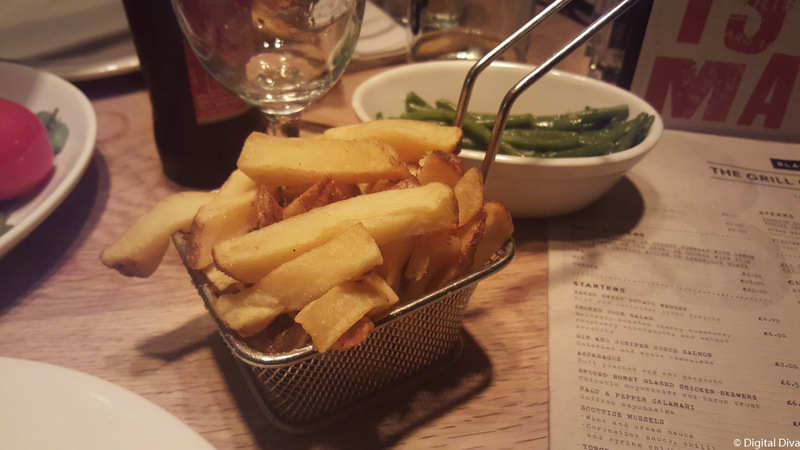 The steak came with chips and green beans….and we demolished it all. It was cooked beautifully – medium rare, very tasty and seasoned well. I’d highly recommend. We were pretty full after all those oysters and the massive steak, so we went for a liquid dessert. 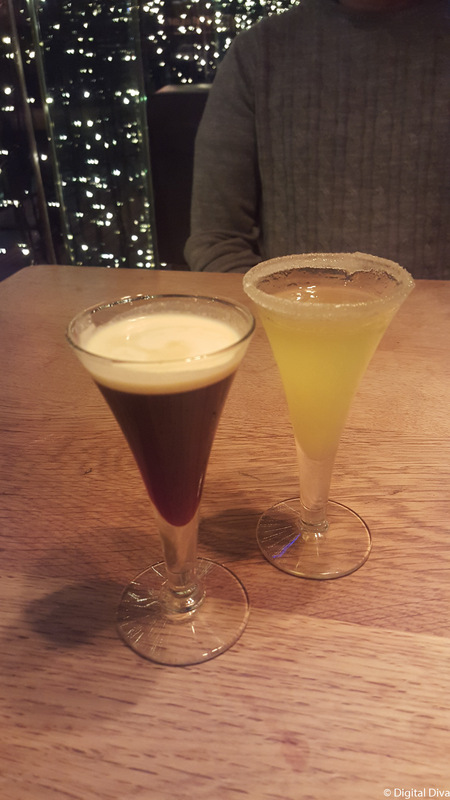 I had the ‘Jaffa Cake’ (Santa Teresa Rhum Orange liqueur, Mozart dark chocolate liqueur and whipping cream) and J had the ‘Lemon Drop’ (Cariel Vanilla, Limoncello and lemon mix with a sugar rim). The Lemon Drop could be made perfect by adding a little lemon sorbet maybe…the Jaffa Cake was ah-may-zing! 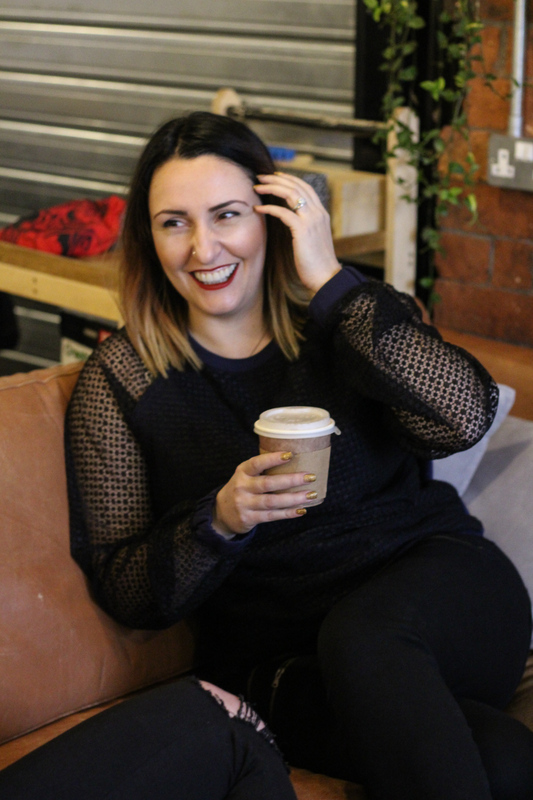 So, would I recommend going to the Blackhouse Restaurant in Leeds? Absolutely! We really enjoyed ourselves…the vibe was great, the service was very good (our waitress had great knowledge of all the menu) and the food was very tasty. We liked it so much that J has booked his company’s Christmas meal there. You can find the menus and contact details here. * Please note that the meal was provided to us free of charge for review purposes. My opinions are all my own. Oh my goodness, the steaks look to die for. There’s nothing I enjoy more than a place that does an amazing steak. I always notice this place because of the twinkly lights.